My friend wore it to school a couple of times and I couldn't stop noticing the beautiful smell, I went to the store to check out attars and I don't usually buy attars from Al-Rehab, but this was a must have! 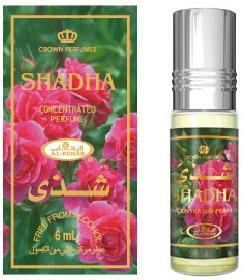 Shadha is a long-lasting white floral. I get a great deal of sweet jasmine with a little soapiness. This is not a delicate scent--a light touch is all that's needed. My Western nose considers this a feminine fragrance. I love this fragrance! Everyone does! It's so unique it has a soft floral scent that lasts a very long time. Not a day goes by without someone asking what my perfume is. Where can they buy it? So I researched the company and here I am! I'm glad to share the website! Loved this one. Got comments when I wore it. Perfect for every day and special occasions.